The Coca-Cola Company (NYSE:KO) is scheduled to announce its third quarter results on October 30, and even though the core performance might remain solid, the top line is expected to take a hit due to the refranchising of bottling operations across geographies. This trend has continued for the past several quarters, with a 15% headwind to the revenues reported in the second quarter. Meanwhile, the margins are expected to continue their upward trajectory as a result of the divestiture from the low-margin bottling business. In the preceding quarter, the comparable operating margin (non-GAAP) expanded 300 basis points, helping improve the earnings as well. The performance in the quarter is expected to be similar to the ones reported by the company in the recent past, with revenue growth (excluding the impact of refranchising) being driven by price increases and product mix, with a diversified portfolio trying to make up for the loss in sales from traditional carbonated drinks. 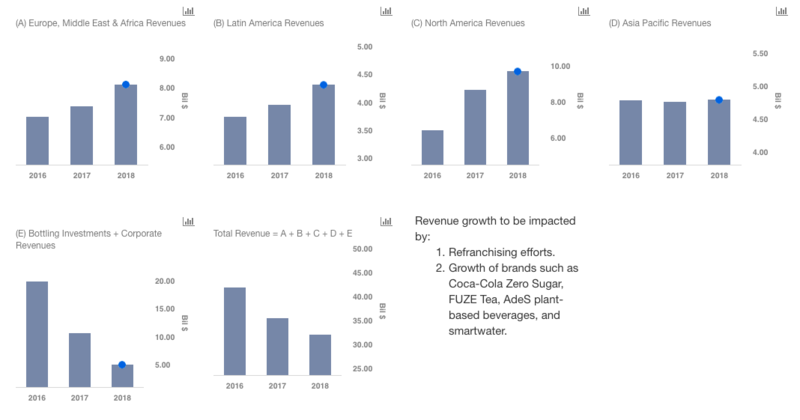 The revenue growth is expected to be driven by products such as Coca-Cola Zero Sugar, FUZE Tea, AdeS plant-based beverages, and smartwater, while earnings growth will be spurred by a reduced tax rate, share buybacks, and operating margin expansion as a result of its refranchising efforts. We have a $52 price estimate for Coca-Cola, which is higher than the current market price. The charts below have been made using our new, interactive platform. The various driver assumptions can be modified by clicking here for our interactive dashboard on Our Outlook For Coca-Cola In Q3 & FY 2018, to gauge their impact on the earnings and price per share metric. 1. Success of Coca-Cola Zero Sugar: Coca-Cola Zero Sugar has been launched in over 20 markets, with a reformulated product, evolved marketing, and new packaging. The brand witnessed positive results, reflected in the double-digit volume and revenue growth in Q2. This brand along with others, such as its water portfolio, ready-to-drink-tea and coffee, etc. are expected to help Coca-Cola deliver 4% organic revenue growth in FY 2018. 2. Diet Coke Revamp: The success of Coca-Cola Zero Sugar prompted the company to reformulate a number of other brands, as it clambers to keep up to pace with changing consumer preferences. One such brand has been Diet Coke, which had been plagued with declining volumes recently. To arrest this decline, Coca-Cola decided to revamp Diet Coke. While the original Diet Coke remains, four new flavors of it – Ginger Lime, Feisty Cherry, Zesty Blood Orange, and Twisted Mango – have been introduced, keeping the millennial generation in mind. The positive customer response has been reflected in the return to volume growth in North America in the first quarter, for the first time since 2010, and revenue growth in the second quarter, as well as year-to-date. 4. Acceleration Of Sparkling Portfolio: Last October, KO acquired the U.S. rights to Topo Chico, a premium sparkling mineral water brand. By the end of the first quarter, the first full quarter of ownership, KO increased distribution coverage within the convenience retail channel by 25%. Consequently, the brand grew its U.S. retail value over 30% and gained value share in the fast-growing sparkling water category. In Q2, KO reported 5% retail value growth in its sparkling portfolio, while in North America, the company’s no-sugar sparkling soft drink portfolio accelerated from the first quarter, resulting in 7% retail value growth, driven by Coca-Cola Zero Sugar and Diet Coke. 5. Sugar Tax: The sugar tax came into effect on April 6 in the U.K., with the tax levied on drinks having more than 5g of sugar per 100ml, while a higher levy is imposed on drinks with 8g per 100ml or more. Keeping this in mind, the company has reformulated a number of drinks to reduce the sugar content. KO has also put an increased focus on brands such as Coca-Cola Zero Sugar and the newly revamped Diet Coke, ensuring that two-thirds of the total portfolio will not necessitate a need for the payment of the sugar tax. The company has also put a greater emphasis on smaller packaging. Meanwhile, in South Africa, where a sugar tax was also implemented, Coca-Cola had a poor quarter. The company was not as aggressive as its competitors in the reformulations, but has readjusted, which should result in a better second half performance. 7. Impact Of Tariffs: The increase in the price of steel and aluminum resulted in cost pressure for the company, forcing the company to raise prices in North America in the middle of the year, a move that is “relatively uncommon.” The Trump administration has levied tariffs on steel and aluminum, among others, imported from a number of nations, including the European Union, Canda, and Mexico, which has resulted in an increase in the price of soda cans. 8. Killing Of “Zombie” Brands: Coca-Cola has been identifying and killing zombie brands and SKUs (Stock Keeping Units), while focusing on products that are performing well. In the Middle East and North Africa (MENA) segment, the company has recognized 125 underperforming SKUs to eliminate, and till date, it has discontinued 60% of those, and intends to delist the rest by the end of the year, allowing KO to reallocate resources to brands and strategic initiatives that are delivering the highest return.